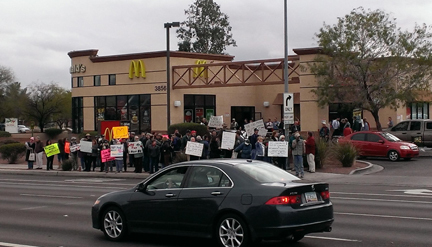 An estimated 80-100 protesters representing several liberal organizations protested low wages for fast food workers at McDonald’s in midtown Tucson. Protests against the low wages paid by multinational corporate giants have been sweeping the country, since the Occupy Movement raised the consciousness of the 99%. On Black Friday, Nov. 29, at Walmart stores nationwide and again Thursday, Dec. 5 at McDonald’s restaurants nationwide, workers, unionists, progressives, and other liberal activists protested unfairly low wages and barriers to unionization for millions of US workers. With profits, CEO pay, and wage disparity at all time highs, isn’t it time to raise the minimum wage to a living wage? Or better yet, isn’t it time to end income disparity in our country? Tucson Police forced low wage protesters to stand in the narrow curb lawn at Speedway and Alvernon, in front of McDonald’s. 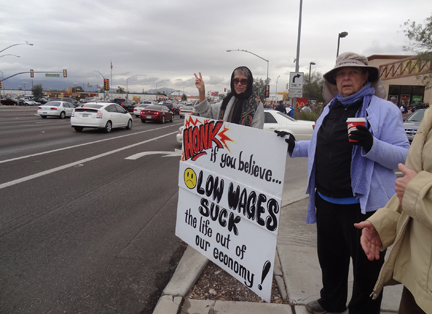 At McDonald’s, approximately 80-100 citizens braved chilly temperatures and intermittent rain to protest low wages. 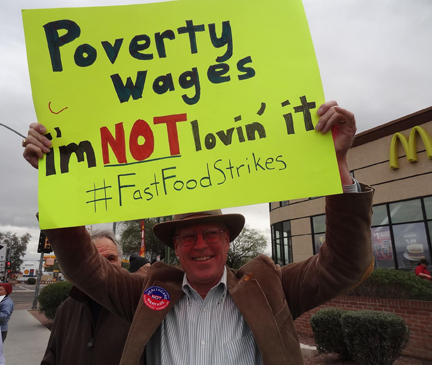 In the days before the local protest, right wing radio host Jon Justice shared PDA Tucson’s Facebook announcement about the event and urged his Facebook followers to come to the midtown McDonald’s, show their support for the fast food chain, and eat some good food. (Excuse me, but McDonald’s hasn’t served “good food” in decades– if ever.) This resulted in a flurry of comments on the PDA page and Justice’s page about the “entitlement mentality”, people being “paid what they’re worth”, and the fast food industry being “one key stroke away from 80% automation”– justifying Arizona’s $7.80/hour minimum wage and offering support to McDonald’s franchisees who make millions on the backs of workers. PDA Tucson’s Jim Hannley, chair of the Economic and Social Justice Team, with PDA Tucson Chair Phil Lopes, behind him. Protests against multinational corporations like Walmart and McDonald’s rage in the streets, as news media report the pros and cons of income disparity and the US government votes on continued austerity policies for workers and continued pork for the military-industrial complex. With income disparity at an all-time high, just 51 Americans own $1 trillion of the country’s wealth. Compare this to 1982– at the dawn of President Ronald Reagan’s trickle down economics scam– when 1500 Americans owned $1 trillion of the country’s wealth. Our wealth is 30 times more concentrated today than a generation ago; if this trajectory continues, in another 31 years, just 12 Americans will own $1 trillion, according to Bob Lord, writing for AZ Central. Higher pay and outsize stock market gains are flowing mainly to affluent Americans. Yet these households spend less of their money than do low- and middle-income consumers who make up most of the population but whose pay is barely rising. … analysts say the economy would be better able to sustain its growth if the riches were more evenly dispersed. For one thing, a plunge in stock prices typically leads wealthier Americans to cut sharply back on their spending. A wide gap in pay limits the ability of poorer and middle-income Americans to improve their living standards, the economists say. About 80 percent of stock market wealth is held by the richest 10 percent of Americans. That means the stock market’s outsize gains this year have mostly benefited the already affluent. 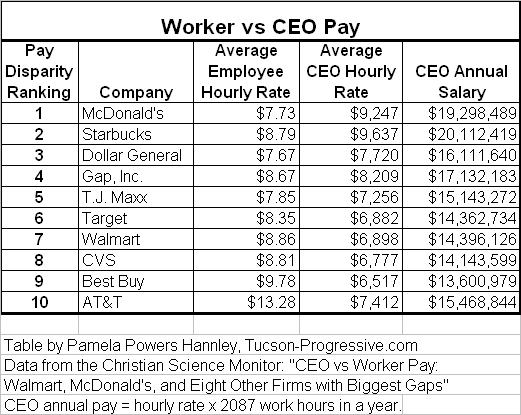 The full breakdown of the 10 US corporations with the highest wage disparity is in the table below, along with the CEO’s annual salary, estimated by multiplying the CEO hourly rate by 2087 hours in a full time work year. It’s time for Congress to stop kowtowing to the 1% and tell the American people (who will be losing food stamps and unemployment with the new budget deal) how they can justify NOT raising taxes on people who make $9247/hour. Ending corporate welfare is long overdue. A picture of wage disparity. Thanks to Jim Hannley and Connie Saddler-Nelson for the photos of the protest. This entry was posted on December 18, 2013 by Pamela Powers Hannley in Arizona, Capitalism, Congress, democracy, equality, jobs, Occupy, Political corruption, Trickle Down Economics, unions, War on Poverty and tagged income inequality, McDonald's, minimum wage, Walmart.